The hulking splendour of St Paul's Cathedral looms over us in the near distance. It's all we can see through the large bay windows of the elegantly dressed room, casting a daunting shadow over all inside. And through the windows comes the sound of singing, beating drums and the general merriment of an evidently large group of people. It's obvious even before the actors take the stage that Steve Waters' wonderful new play is set during the few months at the end of 2011, when Occupy protesters pitched their tents on the cathedral doorstep. But this is no piece of leftist banner-waving. Occupy might be the backdrop (literally) but our subject is the St Paul's diocese, and the conflicts, soul-searching and general turmoil unleashed by the protest within the church. 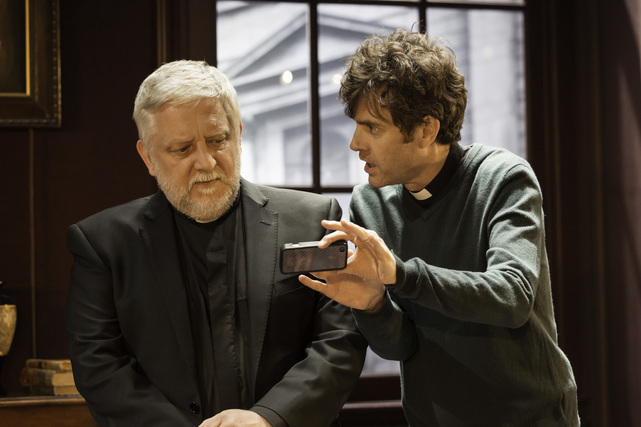 At the centre of this story-behind-the-story is the dean of the cathedral (a typically magnificent Simon Russell Beale), who must choose between an instinctive sympathy for the protesters' cause and his responsibilities to the church, the congregation, the public and the city. On one side, he is lambasted for not standing shoulder to shoulder with Occupy by a younger, left-leaning canon chancellor (Paul Higgins in the Giles Fraser role). On the other, he is subject to sinister threats by a repulsive lawyer for the City of London Corporation (Shereen Martin), who wields her passive-aggressive persuasions with cupcakes and a skin-crawling charm. Taking place in close to real-time on the morning before the reopening of the cathedral, we see the Dean at a gut-wrenching impasse. He is a good man in an impossible situation, bombarded by conflicting advice from colleagues with no real appreciation for the intractability of his situation. Which couldn't be further from the audience's experience: one of the great strengths of both the play and Russell Beale's performance is that we feel his dilemma so keenly. The play doesn't judge or push us one way or the other. And even when those around him offer passionate if short-sighted pleas, we are firmly in the dean's shoes, weighed down by his inner turmoil, feeling his anger and quiet despair. With superb direction from Howard Davies, and a stellar supporting cast, this is a tense, fascinating and surprisingly funny new drama about a seldom considered element of an important moment in recent history. On a more basic level, it is a tragic piece about the perils of leadership, and the difficulties of wielding power when you answer to a higher one. Temple is on at Donmar Warehouse until 25 July. Tickets £7.50-£35. Londonist saw this show on a complimentary ticket.